ICARUS @ 2015 = DUMS⊃ SQUARED! Greek mythology tells us that there once lived a very sagacious craftsman called Daedalus. He was so clever that he was able to create wings, which he attached to himself and to his son, Icarus, to enable them to fly. But before the flight, Daedalus warned Icarus not to fly too high towards the sun, as the sun would melt the wax with which the wings had been fixed to his arms. However, once the flight began, Icarus was so intoxicated with the freedom of the skies that out of sheer euphoria, he forgot his old man’s instructions and flew higher and higher towards the sun. The sun then melted the wax; his wings fell off; and he plunged into the sea – to his death! Of course, scientifically, the story does not check out! For if Icarus had flown as closely towards the sun as the story maintains he did, he would have frozen to death, not plunged to his death, because the wax in his wings was melted by he sun! This is because, the higher you go, the cooler it becomes! But the Greeks did not tell us the Icarus story to illustrate the veracity of scientific principles. They used the story to open up our imagination to the things that we don’t normally think about, because we regard them as impossible to achieve. How often had man looked at the sky and wished he could fly like a bird, into and across the vast expanse of it? The Greek story-tellers knew a story about that age-old aspiration would capture everyone’s attention. So they crafted a beautiful one – and damned the consequences of its not being quite accurate, scientifically. The Wright Brothers of the United States were, of course, the first to realise mankind’s dream of flying into the sky. On December 17, 1903, Orville Wright piloted the first powered airplane 20 feet above a wind-swept beach in North Carolina. The flight lasted 12 seconds and covered 120 feet. Three more flights were made that day by himself and his brother Wilbur. From those 12 seconds of flight came the knowledge that has eventually turned our skies into major highways for all sorts of planes, and which enabled man to fly to the moon and come back to earth to land safely. The trouble with modern flight, however, is that it depends on hydro-carbon energy for its power, and hydro-carbon energy emits polluting agents into the atmosphere that are so poisonous that they will, if left unchecked, destroy the ozone layer that protects us from the sun’s rays, and bake the earth and all the creatures in it to death. Now, it isn’t only aircraft that emit poisonous agents into the atmosphere. Motor vehicles – all one billion or so of them, contribute their share. So do factories and the electricity-generating plants that power most of them. Coal, in particular, is absolutely noxious in the pollution it produces, although diesel isn’t much better. Unless the world does something drastic to change our patterns of power-consumption, we are dooming our children’s children to total extinction. The science is clear – Beijing, in China, is one of the urban centres in the world where the effects of atmospheric pollution are most visible. People often wear face masks in a futile attempt to save themselves from breathing in poisonous air. And motor cars sometimes have to put their lights on in the daytime because the pollution shuts off sunlight. Elsewhere in China, a dense wave of smog began in North-east China, especially in major cities including Harbin, Changchun and Shenyang, as well as the surrounding Heilongjiang, Jilin, and Liaoning provinces, on 20 October 2013. Unseasonably warm temperatures with very little wind across north-eastern China coincided with the initiation of Harbin’s coal-powered municipal heating system. Record densities of fine particulates were measured in the city. It must be pointed out that China is by no means the only country with a major air pollution problem. In April 2014, levels of air pollution smothered London and other British cities. Weeks earlier, heavy pollution had led to restrictions on car use and the offer of free public transport in Brussels (Belgium) and Paris (France). Prof Frank Kelly of King’s College, London, said: “Periods of very high pollution in London arise usually because the city’s normal pollution emissions are increased further by polluted air arriving on light winds from neighbouring areas such as northern Europe. However, whether home-produced or arriving from the continent, the tiny particles we take into our bodies with each breath cause immediate problems”. 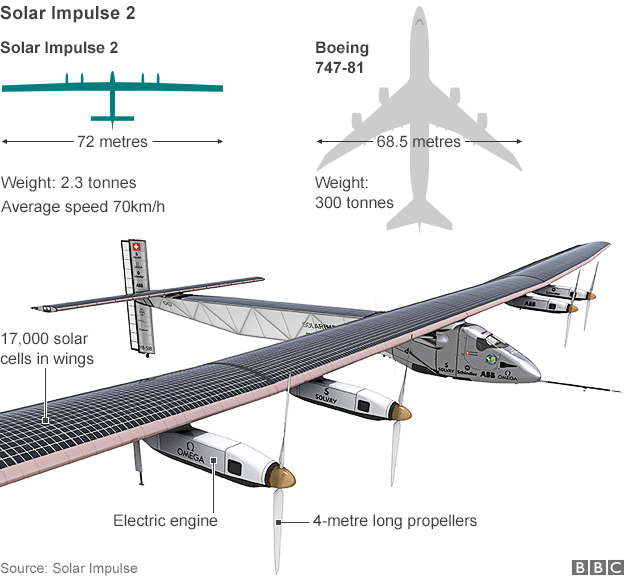 These problems are what make the solar-powered flight of The Solar Impulse 2 from Abu Dhabi on 9 March 2015 so important. The aircraft has a wing-span of 72 metres, which is wider than that of a jumbo jet. And yet it weights only 2.3 tonnes, compared to a jumbo’s 300-plus-tonnes weight. Its light weight will be critical to its success. So, too, will the performance of the 17,000 solar cells that line the top of the wings, and the energy-dense “lithium-ion” batteries that will collect and store energy for use to sustain flying by the aircraft at night-time. With refinement, the 17,000 solar cells will be whittled down to a hundredth of that number, if not a thousandth, as the fast-growing science known as “nano-technology”’ is brought into play in the capture and application of solar energy. The Corresppondent adds: “The price of solar electric panels [has fallen by] 70% in recent years and costs are expected to halve again this decade….And Deutsche Bank [of Germany] forecasts that, based on current fossil fuel prices, solar will produce power as cheaply as gas in two thirds of the world before 2020. In the UK the solar industry thinks it can compete with wind within 18 months and with gas in the near future. In the USA, solar jobs already outnumber coal jobs. “ For PV, O&M costs appear to be in the neighbourhood of $20-$40/kWAC-year, or $10-$20/MWh. CSP O&M costs (for parabolic trough) are higher, presumably due to the plumbing and thermal components, and come in around $60/kWAC-year. the inverters as a way to boost capacity factor. Over to you then, our DumsƆ operators! You have nothing to lose but your valueless excuses.